Hi! 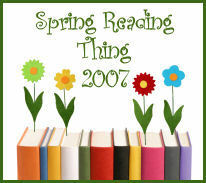 I just joined the Spring Reading Thing too! I wanted to say that I read “Sense and Sensibility” a couple of months ago and just loved it! Such beautiful language! I’ve also been eyeing “1776″ for a mighty long time now and look forward to your review! Welcome aboard! You moms with young children and good reading habits put us old moms to shame! Shopaholic is such a fun read. Sense and Sensibility is a great read, one of Austen’s best. I’ve heard great things about The Double Bind…I’m sure I’ll eventually read that one too! Looks like a great list! I finished The Mommy Manual a couple weeks ago and it has LOTS of highlighting in it now, lots of stuff I want to make sure I implement. Thanks for joining the challenge. Enjoy your books! Confessions of a Shopaholic…I have always wanted to read that! I hope it is good. Happy Reading. I am almost finished studying Nehemiah online with Beth Moore. It has been excellent! 1776 is on lots of other lists. I may have to read that one in the fall as I love history. Ooh, Confessions of a Shopaholic is a good book – funny! I also enjoyed Yada Yada Prayer Group. Happy reading! I love the Shopaholic and the Yada Yada books. We have a few books in common (1776 and Double Bind)! We will have to compare notes! Happy reading! This is the second list I’ve seen 1776 on. I like non-fiction and even history, but more cultural type of history, so I’m not sure if I’ll be able to read this.